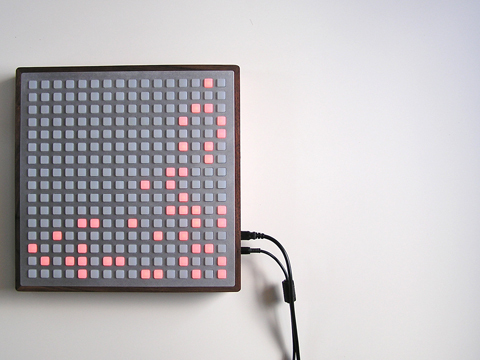 MonoMIDI is a step sequencer to be controlled via the monome. It’s based on manipulating Live MIDI clips, rather than using live.step or other means. So in my opinion, it fits the workflow better where one might use a keyboard next to a monome or an MPC. 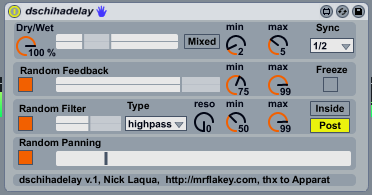 Part of the code base was taken from the Ableton Clip Step sequencer, thx for that. Unfortunately, the monome isn’t recognized as a control surface by Live which was one of the reasons for developing it. The detailed documentation can be found below, as well as the device. As already announced some time ago, I didn’t particularly like the complexity of the MonoLive suite which would require at least one device per track to be controlled by the monome. As a result, there is the next version of MonoLive which combines all track based functions in one single device while it still allows to plug-in additional devices which would require the whole monome real estate (such as MonoParaSteppa or MonoMIDI…stay tuned for that). In addition, it enables the monome to act as a control surface allowing you to select any device within your live set and to control its first 8 parameters (hint: use racks to expose the parameters you like). and there is more, just have a look at the documentation link below. As requested by quite a lot of people, I added the ability to store parameter assignments within live sets, which are now recalled at load time. All the other device settings including the actual sequences are stored as well. MonoMIDI doesn’t require an additional device to be used anymore. and there is more, so stay tuned. Fresh off the press, there is another update to MonoParaSteppa which brings some quite interesting new features. First of all, the device drop down now includes the Track Mixer which allows you to modulate Track volume, Panning, all of the Sends as well as – in case of inserting the device into the master track – the Cue volume (not sure that’s needed) and the crossfader. In addition to that, version 1.1 introduces using any waveform as modulation sequence, just drag a .wav or .aiff file onto the respective device section, and the waveform will be mapped onto the sequence. A sine, square and triangle waveform is already included and can be accessed via the action menu (the three bottom entries). It works quite smooth with increasing the step number to 64 and using glide 2 mode. The loop braces of the step object give you even more control which section of the waveform is used for modulation. The other new thing is the introduction of the MonoParaSteppaMidi device which is an (almost) exact replica of the MonoParaSteppa one. So why the hell another device ? There is one important difference, while the original device sports a beat detection mode (based on transient analysis), the steps of the MIDI device can be triggered via note-on’s which opens quite some new options as well. After some positive feedback for the beta version of MonoParaSteppa, there is an update for the parameter modulation device. Besides bugfixing, the main changes are the introduction of a beat detection mode and more extensive monome support. With Beat detection, a new modulation step is executed upon detection of a beat. Of course, this can be adjusted per parameter and allows for activation of audio or midi devices which need explicit triggering (e.g. stutter effects). The sensitivity of the beat detection algorithm can be adjusted globally by setting the minimum velocity (the slider in the left section, below UDP settings). Beat detection mode itself can be activated with the toggle on the right side of each parameter area. In Sequence mode, all 6 sequences can be edited directly on the monome. Changes in the device are reflected as well, and all monome sizes are supported (you might need to adjust the step length to take advantage of a 128 or 256). The sequence to be shown can be chosen with buttons 3-8 of the bottom row (control row). In all remaining modes,all parameter/sequences is represented by columns 3-8. In Function Mode, it is possible to alter the sequence drastically. The buttons of each column are mapped to the following actions (in order). In Value Mode, each column displays the current value of the parameter whether the sequencer is running or not. If not, you can change the parameter value manually via buttons 1-7 of each column. The buttons of the control row can be used to start/stop the sequencer. In Range Mode, the modulation range (the range which the parameter value can have) can be adjusted per parameter via buttons 1-7 of each column. In order to define whether one wants to adjust the min or the max amout, the buttons of the control row can be used. If not pressed, the lower boundary will be adjusted when pressing a button within the respective column, if keeping the bottom row button pressed, the upper boundary will be adjusted. Please note that for the beat detection mode, the max external bonk~ is required which can be downloaded here (for Mac) and here (for Windows). For Mac, it is included within the frozen device, so you guys don’t need to worry. For now, the only things left to be done (beside any interesting suggestions from you guys) is “ticking the documentation box” and introducing the ability to recall parameter assignments. So stay tuned ! One thing missing from MonoLive so far was the ability to control devices and their parameters via Monome. There are already quite some good M4L devices floating around such as the Single Parameter Sequencer or the 3X Parameter Sequencer, but none to be controlled via a monome. So I made my own (partially based on the second one above, thx Ivehon), and now it’s become quite a beast. Besides adding monome support, the idea was to make it work standalone as well (without using the whole MonoLive framework), and to add “some” randomness to it. Mission accomplished. In terms of monome control, the device supports three modes which can switched via the button 1 of the bottom row (control row). The default mode (no LED) allows you to select the respective parameter with button 3-8. The respective sequence will be displayed and can be changed with the buttons of row 1-7. In Current Mode (keep button 1 pressed for half a second, LED will blink), buttons 3-7 of the control row 8 represent the 6 parameter sequences and allow you to start/stop each sequence. If the sequencer for the respective parameter is running, the LED will be lit. The columns 3-8 above the control row will show the current value of the parameter as it is being modulated via the sequencer. If the sequencer is not running, you can modify the value for the respective parameter manually. This allows for mixing automatic modulation with live changes. As usual, it’s the first shot (v0.9), so let me know what does and does not work, and sorry for the (as of yet) nonexisting documentation, I will work on it. Today is another one of those very few occasions that the monome team is releasing a bunch of new devices. This time, it is a 200 batch of the slick and brand new 64 grayscale devices. Due to heavy demand, the order links will be posted 1st of january, 1pm EST sharp, so check the time and have your google checkout account handy. Good luck, they will be gone very fast. 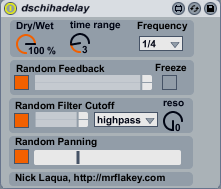 Probably the last update for 2009, after some sleep and feedback as well, there is a new version of dschihadelay. Besides fixing some bugs (synchronisation, randomisation and panning), the device is now fully truly stereo, meaning that both input channels get processed. For modulation purposes, the boundaries for the different ranges (delay time, feedback amount, filter cutoff) can now be automated with Live due to introduction of the Live UI dials (designated “min” and “max”). In terms of the signal path, you can choose either to use a mixed wet/dry signal or only the wet portion of the sound via the “Mixed” switch. The Filter can be placed in two positions, either within the feedback loop (“Inside” switch), behind the delay unit (“Post” switch).Of course, you can use both of them as well. Please be careful with the resonance settings, especially when activating the filter within the feedback loop. 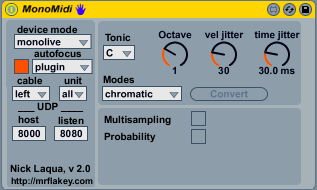 When cleaning up my laptop, I came across monohad a former project of mine where I embarked on porting the Apparat performance patch dschihad to Max5 while enabling it to be used with the monome. Eventually, I abandoned (or should I say “paused”) the project when the patch got too big and too resource-hungry. Still, there are some goodies in the code, so I just took the random delay section and made that little m4l audio device. Essentially, it is a random delay with random feedback, random filter cutoff and random panning. quite some randomness, so I suggest to put a limiter behind it, otherwise you might risk your expensive gear. In more detail, it is a single-tap delay unit with random delay times (the range can be chosen) which is synced to the Live transport with a variable frequency. The range for the feedback amount as well as the range for the filter cutoff can be chosen using the two sliders. It also allows to freeze the feedback, in that case, a limiter would be essential. The toggles on the left hand side switch off the different parts of the device (feedback, filter, panning). Please note that for now, only the left input channel is processed. If anyone is interested, I might change that to stereo mode. …..and everywhere, the online ratings and “Best of” selections are popping up (pretty sure rapidshare and others see some major traffic increase as well). If you are keen, that guy keeps quite an impressive list of “Best of” lists and rating through out the net. One of my personal favourite are the reviews on Headphone Commute, this year coming as 15 different lists of their 10 favourite albums of 2009, each list with a different theme. Good stuff also comes from Drowned in Sound, Pitchfork and – for the more electronically minded – from Little White Earbuds, the Resident Advisor Poll and last but not least BLEEP. ©2008 mrflakey.com. All rights reserved. RSS feed. This site uses the Basic Maths theme for WordPress, designed by Khoi Vinh & Allan Cole.